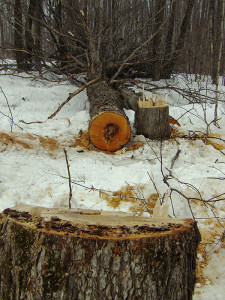 Timber: One of the felled maple trees cut down with the bottom section removed. Credit: Michigan Department of Natural Resources. Cut: A close view of one of the maple tree cuttings. 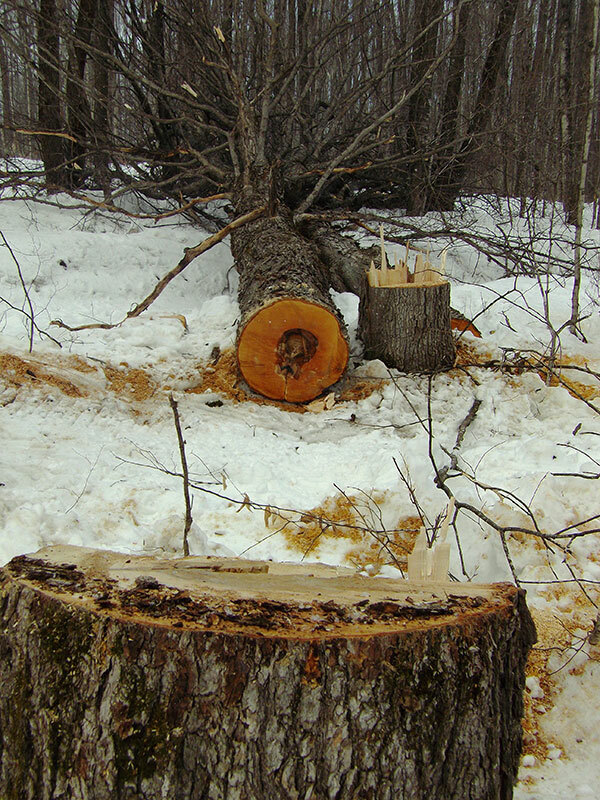 Michigan Department of Natural Resources conservation officers are continuing to investigate the theft of sugar maple logs from public state-managed lands in three northern Lower Peninsula counties. Three males in their mid-20s, one each from – Cheboygan, Charlevoix and Emmet counties – have been arrested and charged with 1-year misdemeanors or 5-year felonies for removal of forest products. Names are being withheld pending arraignments. Prosecutors in Cheboygan and Charlevoix counties issued the arrest warrants. Officers expect more charges to be authorized as the investigation moves forward. Late last year, conservation officers began receiving public complaints about large sugar maple trees being cut on state forestland. Only the thickest part of the trees—the lowest 8-12 feet—was taken most often. In many cases, there were several valuable saw logs left on the site to rot in the woods. More than 100 logs were allegedly stolen. Investigators developed several suspects with the help of citizens and members of the timber industry. These suspects allegedly continued to steal veneer maple logs from state land. The logs were sold to various sawmills. “Multiple sites were discovered and the total value of stolen timber is tens of thousands of dollars, with more sites being discovered,” Drogowski said. Samples of the logs sold to mills were recovered as evidence. DNR foresters were able to help match these logs ato trees at the cutting sites. With other evidence, witnesses and statements, officers were able to obtain the felony and misdemeanor arrest warrants. Now that spring has arrived, more people are getting out into the woods. 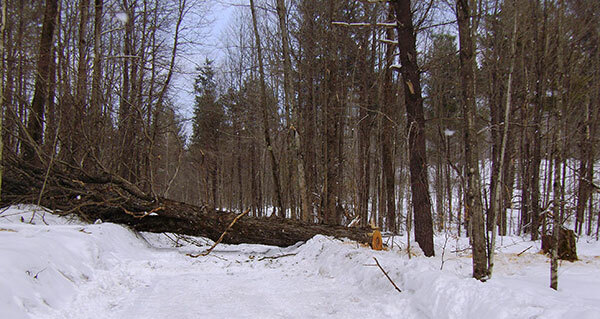 Conservation officers encourage citizens to report any locations where trees have been cut on state-managed land, within close proximity to trails and roads, most often with only the lower portion of the trees removed. To report information on this case, contact Lt. James Gorno at 989-732-3541 or call the Report All Poaching hotline at 1-800-292-7800. Those providing tips may remain anonymous. The RAP line offers rewards to tipsters. Amounts vary depending on the incident being investigated and the value of the information provided. Out of concern for its customers, Murdick’s Famous Fudge, 230 Bridge Street, Charlevoix, Michigan, has issued a voluntary recall of its individually wrapped caramels (all varieties); peanut brittle; cashew brittle; and saltwater taffy (all varieties) because the products may have been handled by ill store employees. The recalled caramels, nut brittles and saltwater taffy were sold from the Charlevoix Murdick’s Famous Fudge store on Bridge Street only. This recall does not affect any other Murdick’s locations. The recall was initiated after the local health department investigation of alleged illnesses associated with eating caramels produced at this location indicated that some employees of Murdick’s Famous Fudge had been exhibiting symptoms typically attributed to a norovirus infection. Norovirus illness usually begins 24-48 hours after exposure, but can appear as early as 10 hours after exposure. Symptoms usually include nausea, vomiting, diarrhea, and stomach cramping. People may have a low-grade fever, chills, headache, muscle aches, and a general sense of tiredness. The illness is usually brief, with symptoms lasting only 1 or 2 days. If unable to drink enough liquids to replace what they lose from vomiting and diarrhea, medical treatment may be needed to prevent dehydration. The company is working with local and state officials to evaluate its production process to prevent reoccurrence. Consumers who have purchased the recalled products between July 23 and August 3, 2011, are urged to dispose of the products or return them to Murdick’s Famous Fudge in Charlevoix for a refund. Consumers with questions may contact the company at 231-547-4213.